UC Santa Cruz alumnus Nion McEvoy has donated $1 million to support programming for UC Santa Cruz’s Institute of the Arts and Sciences over the next five years. A 1974 graduate of UC Santa Cruz with a degree in literature, McEvoy is now the CEO of Chronicle Books in San Francisco, where he is a major supporter of the arts and a trustee at SFMOMA. The donation was made in honor of his late mother, Nan Tucker McEvoy, former board chair and a principal owner of the San Francisco Chronicle. He is also president of McEvoy Ranch and chairman of the Smithsonian American Art Museum’s Board of Commissioners. McEvoy’s great grandfather, M. H. de Young, was a co-founder of the Chronicle, and the DeYoung Museum in San Francisco was named in his honor. 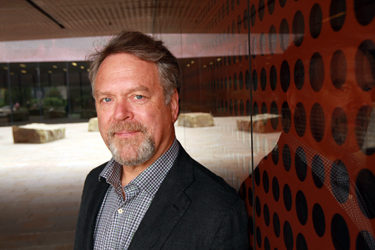 McEvoy previously played a key role in establishing the Grateful Dead Archive at UC Santa Cruz, and his new gift to the campus follows an earlier donation of $250,000 which provided seed money to the Institute of Arts and Sciences. “Nion has been a great supporter of UC Santa Cruz, and this donation truly moves the Institute of Arts and Sciences to a new level by allowing it to develop and expand its exhibitions, events, and residency programs, ” said UCSC Chancellor George Blumenthal. Launched in 2013 with the arrival of founding director John Weber and the start of planning for a new facility, the Institute of Arts and Sciences began developing an innovative public program in 2014. It is currently hosting interdisciplinary artist residencies, presenting public events, co-sponsoring academic conferences, and collaborating with Lick Observatory and the San Jose Institute of Contemporary Art on a future exhibition. Weber noted that McEvoy’s new donation to the campus will be transformational. Programs now in progress include, Collective Museum, a campus-wide exhibition created by the Portland artist group, Public Doors and Windows, created over the course of a two-year residence with the IAS. 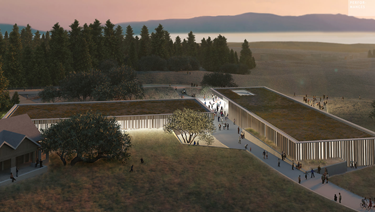 This project frames the entire UC Santa Cruz campus as an immense museum, complete with 50 historic, cultural, and natural sites across campus identified by faculty, staff, alumni, and students. A second residency is also underway with renowned artist Russell Crotty, who has done research at Lick Observatory and consulted with UC Santa Cruz astronomers and astrophysicists about their work. Crotty’s new astronomy-based artwork will be exhibited next fall at the San Jose Institute of Contemporary Art (ICA), along with archival objects from Lick Observatory. Curated in collaboration with the ICA by Weber, Crotty, and Tony Misch, director of the Lick Collections, the project recently was awarded a prestigious Andy Warhol Foundation grant. Future exhibition plans include the Crochet Coral Reef, a project by Margaret and Christine Wertheim of Los Angeles. Since 2005, the sisters have been teaching people around the world to crochet coral forms and learn about how global warming and the acidification of the oceans have compromised these key contributors to marine ecology. This project will include campus-wide student participation leading up to shows on campus at the Sesnon Gallery and at the university’s Seymour Marine Discovery Center in Santa Cruz. “The gift demonstrates confidence in our long-term vision,” noted UC Santa Cruz professor Jennifer Gonzalez, one of the original champions of the Institute of Arts and Sciences, who is featured in a new video about the project now featured on the institute’s web site. “It will offer opportunities for our faculty and students to collaborate on innovative, socially relevant projects with the increased resources of the institute,” she added.